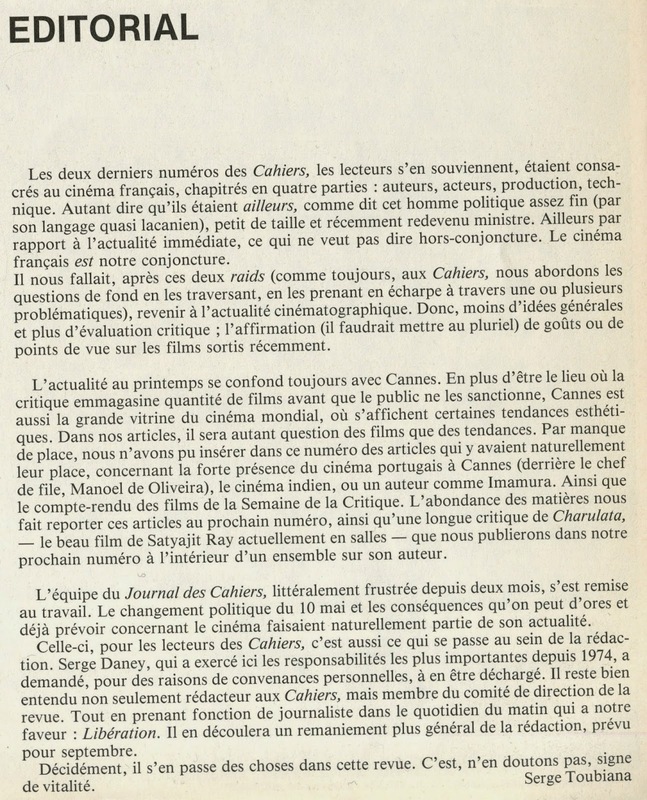 The year 1992 represents a culmination and turning point for Cahiers: its intellectual guide since the mid-Seventies, Serge Daney, on June 12th dies of AIDS at the age of 48, and its chief-editor, Serge Toubiana, after a disenchantment from finally experiencing Cannes as a jury member, in October resigns from his position. Toubiana in his modest farewell Passage de témoin (N.460) – one small paragraph, on the same page as the table of contents –, writes, “For more than ten years I’ve directed this magazine, and I believe that I’ve allowed it room for new developments. But I couldn’t have done it without a close team of friends, and their complicity.” Before leaving, in the previous couple of years, Toubiana updated the layout of the magazine and added new features to the magazine, Cahiers celebrated its 40th anniversary and they would publish a two-volume history of its first thirty years (1951-81), and a new generation of critics were slowly arising to prominence at the magazine and where Thierry Jousse, who was appointed the adjoined chief-editor in 1990, would finally take the helm. It’s a new decade, and the previously mentioned events closed the Eighties, and the current decade seemed like it is up for grabs. 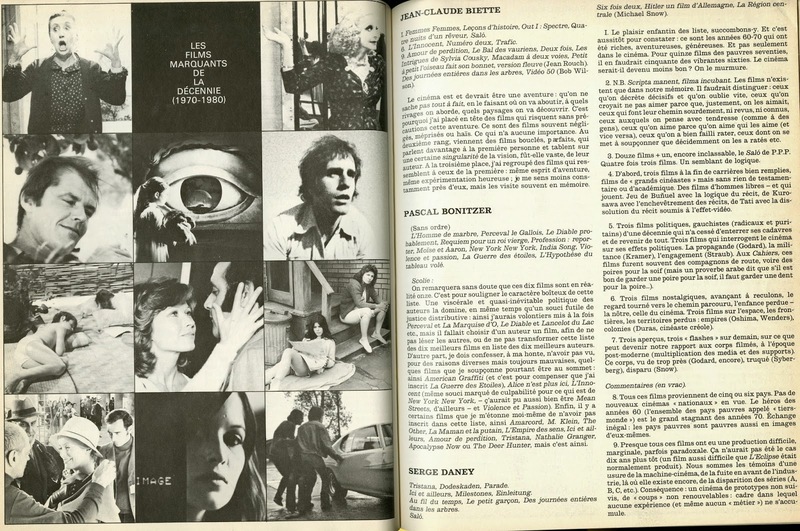 The testimonies in this issue provide a good portrait of Daney: they trace an evolving human being who conceptualized the relationship between politics and art within a new media sphere; they address the importance that he stressed on dialogue and work within a group; as well as his love to travel. 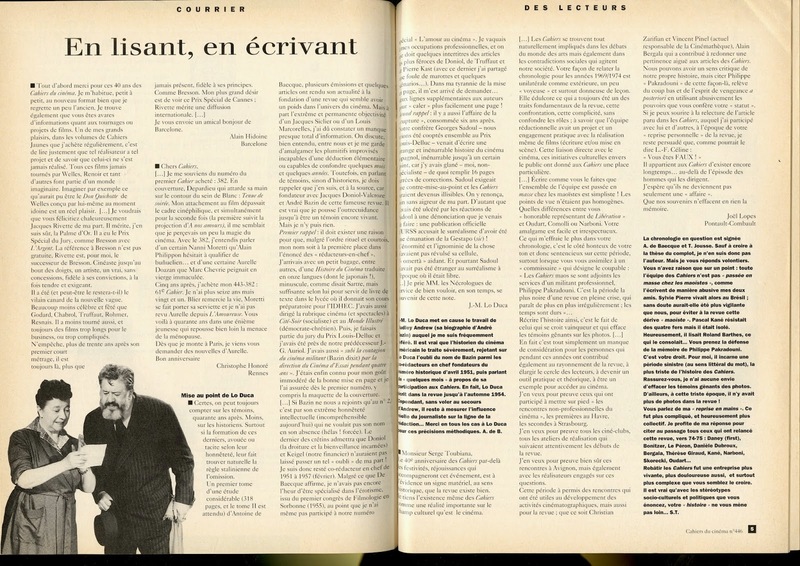 There is also a lot regarding what characterized his editorship of Cahiers from 1974-1981. Serge ‘inherited’, despite himself, the magazine. With his back against the wall, he improvised and, after a bit of experimentation, was able to put the magazine back in place on a much better trajectory… Serge accepted my help, more out of friendship than necessarily my competence. We had a tight alliance, sharing for many years the same somber office, which was already at the Bastille. At the heart of this alliance, he brought the essentials: principals, an immense culture, a project for the magazine founded on the desire to accompany the strongest, and craziest, experiences of the cinema. 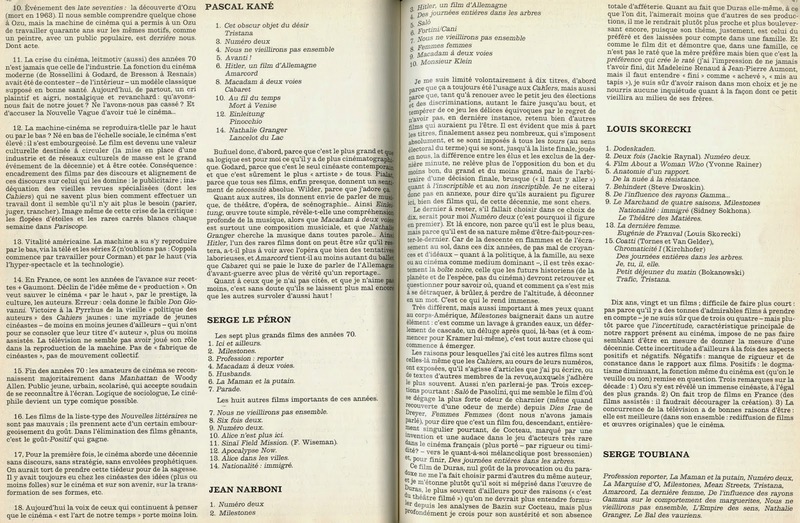 Claudine Paquot, the general secretary of the magazine, highlights how the deux Serges in 1978 would meet her, and how Daney would think that the magazine was missing quelque chose and that she would bring to it a fabrique d’une revue, which would include an open new layout and more pictures that would enrich the texts. Paquot would highlight Daney’s dictionary entry on Italiques in their 30th anniversary issue as just one example of on how they would put together an issue. 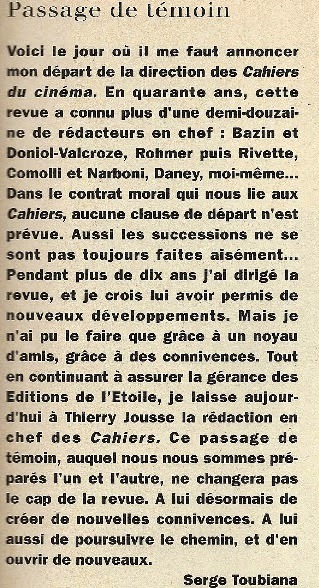 Paquot highlights Daney’s generous personality and the personal impetus of what it meant to carry the Cahiers identiy. And your voice never lacked generosity to discuss Cahiers, its history, its raison d'être, from its largest projects to its smallest notes... First, at the Cahiers office, in a reconverted floor at the Passage de la Boule Blanche; the pleasure of reading all of the pieces, discovering ideas, the quality of style, the work of a critique; precise syntax, the right word, perfect orthography, and especially the respect for each proper name, verifying in its original language, as a sign of respect (Ouch, the day where I spelt it ‘Minelli’! – N.328, Pg. XV). Including: Nouvelle du monde, Image(s) du mois, Portrait, Séquence du mois, Actuelles, Chronique, Hors-Salles. These special eulogy issues, which highlight singular figures in the Cahiers history, would have an importance in Toubiana’s editorship: As a way to look backwards and to reflect, as well as to use these figures and their lessons as guides while moving forward. 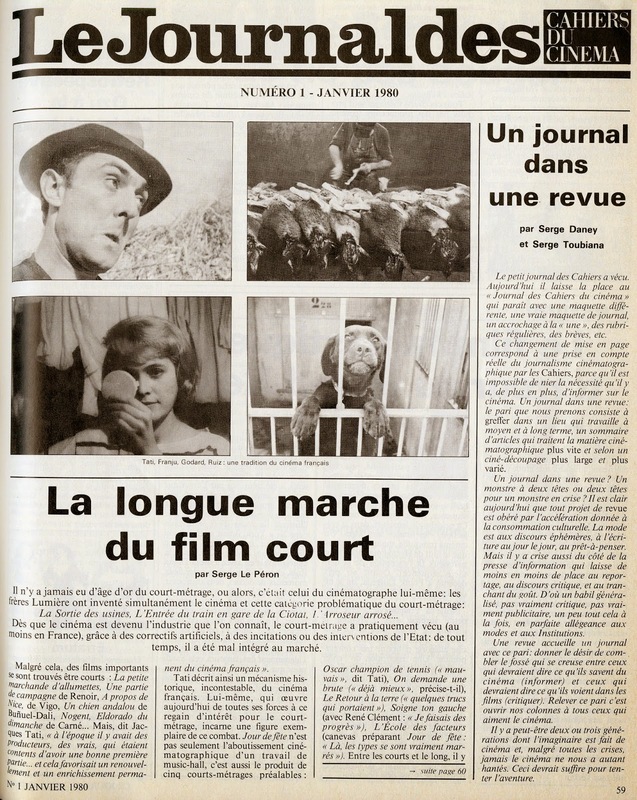 There would be Hors Séries homage issues on Alfred Hitchcock (1981) and Francois Truffaut (1984) after their death, as well as featured dossiers on Orson Welles, John Cassavetes and Sergio Leone, throughout the Eighties. An important figure at the magazine in this period as she would work closely with the new writers and help them through editing, and refining, their reviews, before she would move on to the Cahiers book publishing department. When she died in 2011, Stéphane Delorme, the current chief-editor at Cahiers, would feature an homage to her, with contributions by Toubiana, Alain Bergala, Thierry Jousse, and Hélène Frappat. On Paquot, and Clotilde Arnaud, who was in charge of their administration, Toubiana writes, “Serge Daney and I wanted to re-launch the magazine, to give it a redactional and economic bases. 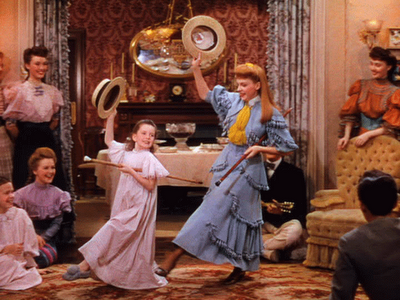 These new recruits, ‘les filles’, were going to help us.” (Cahiers, July-August 2011, N.669).